Residents of Bibstone have been left out of all three stages of South Gloucestershire’s high-speed broadband rollout. The ‘Bibstone Broadband’ group, which has been formed to tackle the issue, says it wants to know why some homes in the village haven’t benefitted from the government funded Broadband Delivery UK scheme which has seen three phases of investment in the county. The rollout of phase 3 is due to take place by the end of this year. He blames poor infrastructure for Bibstone’s problems. Broadband is provided to the village from two exchanges, Falfield and Wickwar. But for the group of homes on the lower end of Tortworth Road, the nearest cabinet is in Charfield, which is too far away to provide decent broadband speed. Fibre to cabinet upgrades were carried out a few years ago, but speeds are still only 10-20Mbps. The telecoms regulator OFCOM defines ‘Superfast’ as 30Mbps and above. As part of phase 3 improvements, a new cabinet was built on the Wickwar exchange only 400m away from where Matt Briggs lives. But he and other homeowners cannot switch to that cabinet because they are on the Falfield exchange. 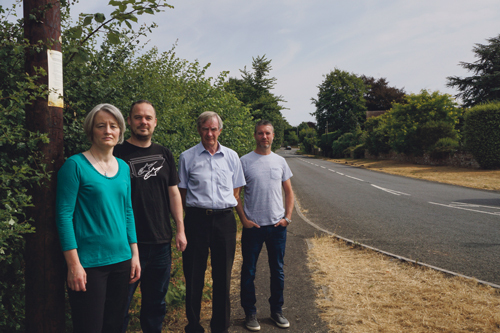 In an attempt to escalate the issue with South Gloucestershire council, the residents have met with councillors John O’Neill and Claire Young, and have since been promised a visit from the council’s Executive Member for Resources, Rob Creer.